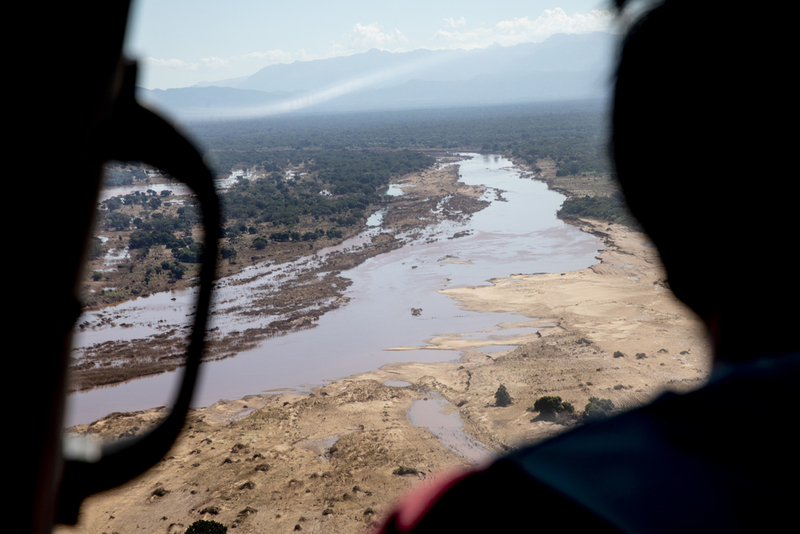 Cyclone Idai hit southern Africa in mid-March, flooding vast swathes of land. It left hundreds of thousands of people homeless and destroyed buildings, crops and infrastructure. We responded to the natural disaster by sending emergency teams and medical supplies to Malawi, Mozambique and Zimbabwe. As part of our response, we deployed four GIS (geographic information system) experts – one of whom was already in Zimbabwe – to support the teams by providing detailed, multilayered maps of the region, in our largest GIS response since the 2014 West Africa Ebola epidemic. MSF teams are increasingly aware of the importance of GIS in helping plan operations and support decision-making in emergencies, and are requesting more operational support than ever before. Two GIS officers, Fabien Lambertin and Camille Gallet were deployed in the early days of our response to provide GIS support for MSF's operations in Mozambique. Surprisingly, such base maps do not exist for many of the regions where MSF works, which are often remote, disaster-prone or home to some of the world’s most vulnerable people. The lack of maps presented a major challenge – until a simple solution was found, known as the Missing Maps project. With the help of OpenStreetMap – a crowd-sourced map – thousands of volunteers worldwide digitise satellite imagery and create maps of the most vulnerable areas of the world for use by aid organisations. The Missing Maps project was set up in 2014 by a number of humanitarian organisations, including MSF. When Cylone Idai struck, its volunteers were quick to swing into action. They have already mapped more than 200,000 buildings and nearly 17,000 km of roads in the affected areas. Zimbabwe is one country for which few detailed base maps exist. MSF GIS officer Last Prosper Mufoya provides GIS support for MSF operations in Zimbabwe. When the cyclone hit, Mufoya immediately activated the Missing Maps community to create maps of the worst-hit area, Chimanimani. Digital volunteers take part in a 'mapathon', run by the Missing Maps, at MSF's Brussels office in 2016. “Chimanimani was totally cut off from the rest of the world, as all roads leading to it were damaged and most bridges were washed away,” says Mufoya. Using satellite imagery, the volunteers focused on capturing roads, buildings and water drainage systems, since very little of this data was available on OpenStreetMap. “Volunteers from all corners of the Missing Maps community, including our Zimbabwean chapter, worked tirelessly to contribute data on the tasks,” says Mufoya. The base maps of Mozambique, Zimbabwe and also Malawi – which experienced dramatic flooding caused by the weather systems associated with the cyclone – produced by the volunteers have been distributed widely to all organisations involved in the emergency efforts, helping them to gain a clear picture of the situation on the ground and to plan a quick and effective response. Anyone with a computer can become a part of the Missing Maps and learning to map is quick, easy and fun. Visit the Missing Maps website to get started today. Once you're ready to map, sign up to the Missing Maps email list to be kept up to date with current mapping needs. Or, if you'd like to map with like-minded humanitarians, head to a mapping party near you where Missing Maps volunteers get together to map a wide geographical area all at once.